An internal Emergency was imposed on the country by then Prime Minister Indira Gandhi on June 25-26, 1975, and it lasted for 19 months. This period is considered as ”dark times’ for Indian democratic polity. Indira Gandhi claimed that due to Jaiprakash Narayan’s call to the armed forces to disobey the ‘illegal’ orders of Congress rulers had created a situation of anarchy and there was danger to the existence of Indian Republic so there was no alternative but to impose Emergency under article 352 of the Constitution. RSS claims that it opposed Emergency promulgated by Indira Gandhi heroically and suffered immensely for resisting Emergency. But there are dozens of contemporary narratives which decry this claim of the RSS. We will be referring here to such two narratives by a veteran thinker and journalist of India, Prabhash Joshi and TV Rajeswar, former Intelligence Bureau [IB] chief who was the deputy chief of IB when Emergency was imposed. They recounted the days of Emergency (or state terrorism) when RSS surrendered to the repressive regime of Indira Gandhi, assured her and her son, Sanjay Gandhi to enforce faithfully the draconian 20-point programme announced by the Emergency regime. Large number of RSS cadres came out of jails by submitting MAAFINAMAAS (mercy petitions). Despite all this betrayal thousands of RSS cadres continue to get monthly pension for persecution during Emergency. The BJP ruled states like Gujarat, Madhya Pradesh, Rajasthan and Maharashtra decided to award a monthly pension of Rs 10,000 to those who were jailed during the Emergency period for more than a month and Rs 5000 to those who were jailed for less than a month. This rule took care of the financial interest of those RSS cadres who might have submitted mercy letters completing only one or two months’ jail term. For securing such a fat pension there was no such condition that the beneficiary should have been in jail for the whole period of the Emergency. Interestingly, in the case of anti-British freedom struggle there has not been even a single RSS cadre to claim the freedom fighter pension. It may be noted that nobody remembers hundreds of Communist youth, branded as Naxals who were killed in fake encounters during the Emergency. 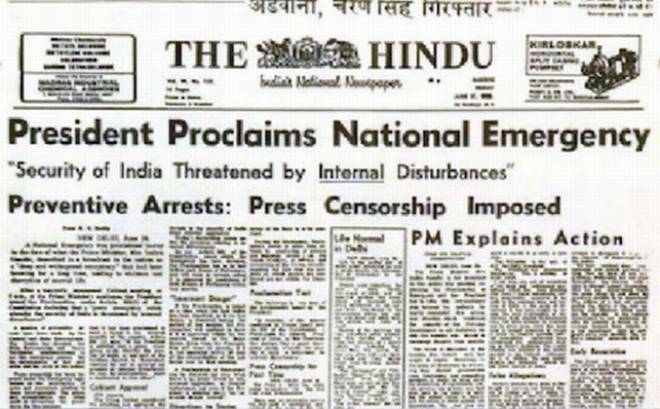 Interestingly, Shiv Sena , the Hindutva co-traveler of the RSS openly supported the Emergency. Prabhash Joshi’s conclusion was that “they are not a fighting force and they are never keen to fight. They are basically a compromising lot. They are never genuinely against the government”. Recently, the former President of the Indian Republic, Pranab Mukherjee was invited by the RSS chief, Mohan Bhagwat to be the chief guest at its graduation ceremony for the new recruits. Pranab Mukherjee was indicted as one of the top leaders of Congress for Emergency excesses. The tragedy of RSS is that India continues to be run under a democratic polity so its love for brazen power has to be balanced by double-game. [vii] Madhukar Dattatraya Deoras, Hindu Sangathan aur Sattavaadi Rajneeti, Jagriti Prkashan, Noida, 1997, 270. Wonderful writing, my dear respected Sir. I’ve never gone through such a remarkable research on the cowardice, despicable and pitiable plight of the RSS. I salute you Sir.